Avengers Endgame, one of the most anticipated movies of 2019, is the sequel to Avengers: Infinity War in the Avengers Series. It is directed by Russo Brothers and presented by Marvel Studios in association with Walt Disney Studios. The trailer of the movie had already been released and received a tremendous response. Fans all over the world are awaiting the movie's release. Meanwhile, Marvel India recently made an announcement that they will be collaborating with A.R.Rahman for a Marvel Anthem exclusively for Indian fans. 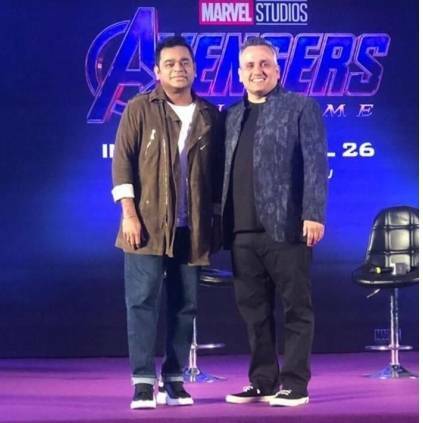 In an event held today at Mumbai, Joe Russo, one of the directors of Avengers Endgame, and AR Rahman released this anthem. The Marvel Anthem has come out now which is composed and sung by A.R.Rahman himself. The song shows glimpses of all the superheroes and their mass moments from the previous installments and it sure is to hype the fans’ excitement. People looking for online information on A.R. Rahman, Anthony Russo, Avengers Endgame, Avengers Infinity War, Joe Russo, Marvel Anthem, Marvel Entertainment, Marvel Studios, Whatever it takes will find this news story useful.